Share Expy Multimedia: MAPOLY: Amosun appoints Akin Ajayi as new Dep. Rector, gives deadline for Ipokia registration. MAPOLY: Amosun appoints Akin Ajayi as new Dep. Rector, gives deadline for Ipokia registration. Almost two months after the Ogun State Government appointed Mr. Ayodeji Salimon as the new Rector of Moshood Abiola Polytechnic ,Abeokuta ,the government has appointed a senior lecturer from Science Laboratory Technology Akin Ajayi as the new Deputy Rector of the institution. He was appointed on Wednesday just as the staff of the institution continue with the indefinite strike. The appointment came as the state government gave a-24 hour deadline for members of ASUP to indicate interest whether to work at the new Polytechnic in Ipokia or not. 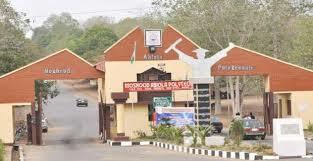 The state government had begun the process of transformation of MAPOLY into Moshood Abiola University of Science and Technology and had ordered the staff to transit their status to the new Polytechnic in Ipokia. The development had led to an indefinite strike by the workers of MAPOLY which had affected the second semester examination as it had been put on hold . In the internal memorandum DATED November 29 and issued from the office of the Deputy Registrar of the institution and directed to all academic staff through Directors / HoDs/ Head of Units, with refrence number MAP/ADM/CON.70/VOL.XVI.231. “Take off of Ogun State polytechnic, Ipokia. “Following the receipt of a circular from the Ministry of Eduction Science and Technology, on the above subject matter, I am to inform you that His Excellency, the governor of Ogun state Senator Ibikun Amosun has directed that as many academic staff of MAPOLY who are desirous of transiting her staff to the Ogun state Polytechnic, Ipokia are urged to established such interest with immediate effect. “A compiled list/ details of interested academic staff will be forwarded to the ministry latest by Thursday 30th Nov. 2017. “You are therefore to indicate your interest at the office of the undersigned with immediate effect”. It has been gathered that the union had unanimously agreed to shun the deadline while it embarks on the strike until the demands are met by the government . The new deputy Rector might be officially announced by the government any moment as Ajayi has accepted to up the task.